These Furniture Sliders Work Great! Easily Move Heavy Furniture on Carpet! I have professionally rearranged furniture for my clients since 1986, long before these handy furniture sliders were invented. Some people now refer to them as "furniture feet" or "furniture sliders". I well remember the old days of risking my health trying to move heavy furniture around for my clients. Now it is so easy, you wouldn't believe that a small framed woman can easily and quickly move a large sofa, table, entertainment center or whatever - and move it by herself with ease. While these aren't the first discs of this nature ever invented, I love them because they are more professional looking and geared for professional work. Some of the other varieties have tended to buckle under the weight of the furniture. These are more study, in my opinion - and they look great too. No longer do I dread having to move my large screen TV or sofa or anything else so I can clean back of it or under it. With the sliders, the job is super easy. Keep your sliders handy any time you want to move something heavy, even if it's just for cleaning or adjusting positions. "The sliders arrived on Wednesday 5 October last. I bought them so that I could move a fairly large sideboard. I used them straight away and they are absolutely fantastic. I knew they would work but did not expect that they would work as well as they do. I am really amazed. Thank you so much for arranging this for me. I know that you went out of your way to post these to Ireland and I really appreciate your help. You have been great. - Anna Hoare, Ireland"
Just tilt the furniture forward or backward slightly, enough to push one of the sliders under each of the four corners. Then easily push your sofa, table, lounge chair, TV unit, armoire - whatever - to the new location. You hardly have to exert any effort. They are amazing! If you're by yourself, just tilt the piece of furniture forward or backward, then push one of the sliders under one corner with your foot. (Just be careful not to untilt the furniture while your foot is near the slider.) It's that simple. I can't tell you the number of times I've moved my furniture from room to room and back again all by myself since I've had these handy little sliders. There's no need for adhesive. The thick, dense foam conforms to any item placed on it, gripping furniture and staying with the object being moved. 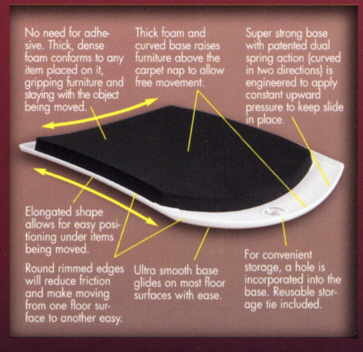 The thick foam and curved base raises the furniture above the carpet nap to allow free movement. They have a super strong base with patented dual spring action (curved in two directions) and are engineered to apply constant upward pressure to keep the slide in place. Their elongated shape allows for easy positioning under items being moved. The round rimmed edges will reduce friction and make moving from one floor surface to another easy. Their ultra smooth base glides on most floor surfaces with ease, especially carpet. 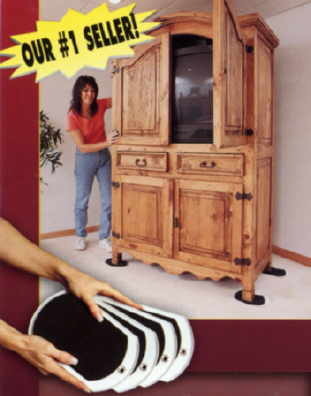 For convenient storage, there is a hole incorporated into the base. Use the reusable storage tie that comes included. The sliders come packaged 4 per set and measure 9-1/2" x 5-3/4". Your investment to protect your back is only $23 per set (4) plus shipping. Won't damage your back or your carpet or furniture. Used by homeowners, housekeepers, floor covering installers, painting contractors, janitorial services, carpet cleaners, interior redesigners and home stagers! Great for moving beds, sofas, entertainment centers, bookcases, desks, dressers, armoires, file cabinets, office furniture - you name it. If it's on carpet, you need these little guys! Purchasing is easy: Secure Shopping Cart/Tools of the Trade. 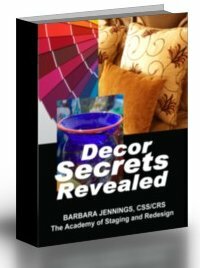 Scroll down until you see the Furniture Sliders for Carpet. Moving heavy furniture or appliances on hard floors? We've got that too! See our felt covered sliders for moving appliances or furniture on your hard wood floors, tile floors, vinyl floors. This steel lifting bar gives you just the right type of leverage to lift one end of a heavy piece of furniture or appliance enough to get a slider under it. It's so easy to use, a child could almost do it. I never go anywhere to redesign or stage a home without my lifter. It's a life saver. It Took My Son's Arrest to Get My Attention! What Will It Take to Get Yours? My son is a law abiding person. But one day he was stopped for a fix-it issue and before he knew what was happening it escalated into an arrest. $5500 later, I got it resolved, but it was pretty intense for awhile. Now we both own a membership that gives us total access to attorneys 24 hours a day. It also gives us total peace of mind too. Watch the brief presentations above or write Dave Fahs (Independent Associate) and request a free DVD. Provide your name and mailing address, phone and email address to: call (714) 330-2243 (Dave Fahs).